Darren Scully, who caused controversy with remarks about African immigrants three years ago, is in the mix for Fine Gael’s backroom decision making body. DARREN SCULLY, THE former mayor of Naas who was forced to resign over comments he made about African immigrants three years ago, is in contention for a position on Fine Gael’s national executive council. Scully, a Kildare county councillor, is one of two candidates in the running for the position on the party’s backroom decision making body. The other is Dún Laoghaire-Rathdown county councillor Neale Richmond. 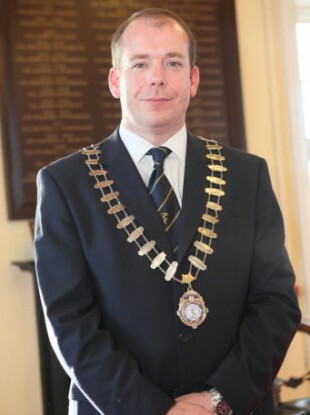 His nomination for the vacancy comes three years after he was involved in a row over comments made about black Africans in his local area when he was the mayor of Naas. The controversy arose after Scully said he would not represent black Africans because he had been “met with aggressiveness, I have been met with bad manners, I have also been played the race card”. Scully subsequently apologised “unreservedly” for his remarks and resigned as mayor, claiming his comments were “open to interpretation” that he did not intend. He was stripped of the Fine Gael whip in February 2012 before having it restored in November 2013 with the party’s general secretary Tom Curran saying at the time it was “time for us to move on” from the controversy. Scully was subsequently selected as a Fine Gael candidate in the Naas local electoral area and was re-elected to Kildare County Council last May. Richmond and Scully will now spend the next week or so lobbying Fine Gael’s 235 councillors who have a vote in the election with the result due on Monday, 3 November. The vacancy on the executive council arises out of Seán McKiernan’s failure to hold his seat on Cavan County Council in the local elections meaning he automatically forfeits his position. The executive council includes the Taoiseach as its president with two vice presidents and Fine Gael representatives from across the country in addition to councillors and members of the party’s parliamentary party. It was most recently in the news when a sub-committee of the council was embroiled in the controversy over John McNulty’s botched selection as the Fine Gael candidate for the Seanad by-election. Email “Councillor involved in African immigrants race row in running for Fine Gael's executive council ”. Feedback on “Councillor involved in African immigrants race row in running for Fine Gael's executive council ”.